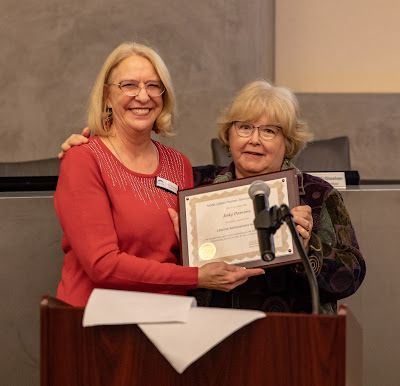 At the Annual Human Services Awards ceremony held by NUHSA on December 4, 2018 in the Shoreline City Hall Council Chamber, longtime local volunteer Judy Parsons was presented with a Lifetime Achievement Award. Judy has a long and impressive list of community engagement, including PTA leadership at all levels, Shoreline School Board Director, North Shore/Shoreline Community Network Board member and Lead Staff, Chamber of Commerce Secretary, co-founder of the CARE Team, and board member of Northwest Neighborhood Network. All this in addition to involvement in her church and choir and raising a family. Judy retired from the Shoreline-Lake Forest Park Senior Center in 2017. Not surprisingly, she is still volunteering, currently as President of NUHSA and with the Shoreline Chamber of Commerce and the Shoreline Historical Museum. 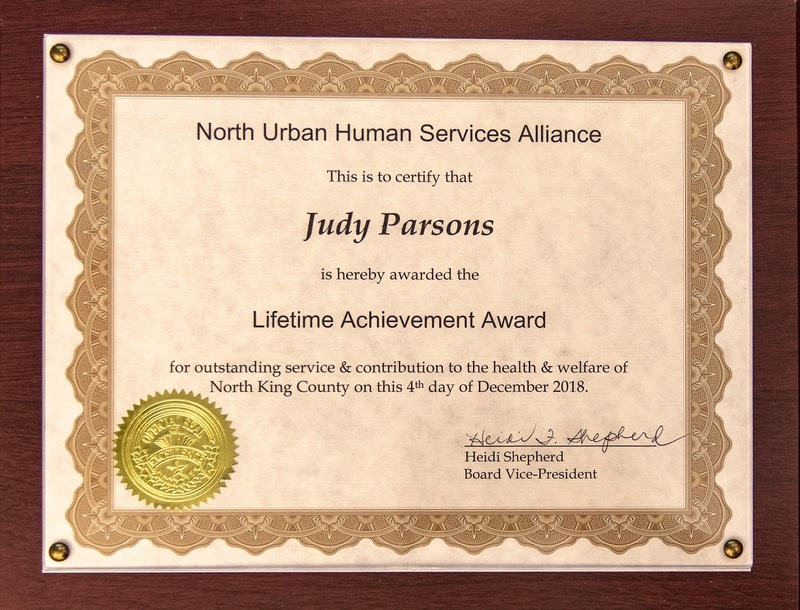 Judy has had a significant impact on our community and in advocating for the most vulnerable. 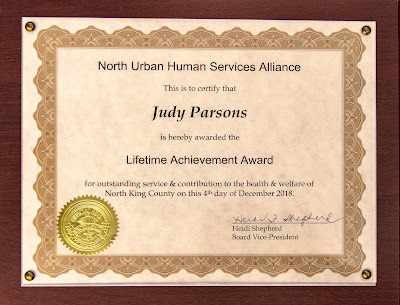 NUHSA celebrates her dedication to the health and wellbeing of all of our citizens and honors her lifetime of service.